NEW YORK (CNNfn) - Pets.com, an online pet supply retailer that has spent millions promoting its brand, has decided to shut its doors. Known for its smart aleck "spokespuppet," made famous by an ambitious television advertising campaign, the company said Tuesday it has begun an "orderly wind down of its operations." 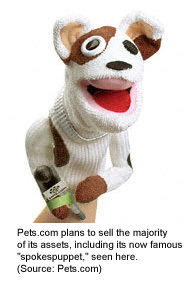 Pets.com said it plans to sell the majority of its assets, including its inventory, distribution center equipment and its sock puppet brand icon. It also said it has laid off roughly 255 of its 320 employees. Executives at Pets.com in San Francisco said the decision to call it quits� came after efforts to raise capital or sell the company outright failed. The company had retained investment banking firm Merrill Lynch to assist in identifying strategic alternatives. Of some 50 prospects, fewer than eight were even prepared to visit with the firm, the company said. "I am deeply saddened by this event and regret that we will not be able to continue our commitment to our customers to provide the very best buying experience on the Internet", Julie Wainwright, Pets.com's chairman and chief executive, said in a prepared statement. "It is well known that this is a very, very difficult environment for business-to-consumer Internet companies," Wainwright added. 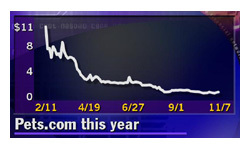 Shares of Pets.com (IPET: Research, Estimates), fell 47 cents to 19 cents in afternoon Nasdaq trade Tuesday. Pets.com is the latest in a slew of business-to-consumer e-commerce companies to shutter their operations this year. Others include Internet drug store More.com, online fashion store Boo.com, online price-comparison service Productopia.com and Eve.com, which specialized in cosmetics and other beauty aids. It also is the second venture with substantial backing from online retailing leader Amazon.com (AMZN: Research, Estimates) to go belly up recently. Amazon holds a roughly 30 percent stake in Pets.com. In August, online furniture store Living.com, which also was backed by Amazon closed its doors as well. An Amazon spokeswoman on Tuesday said the demise of Pets.com will not have a material impact on Amazon's future financial performance because it had already accounted for the loss. Since going public last February, Pets.com's stock has garnered very little investor interest. After ringing up a less-than-stellar first-day return, Pets.com shares have been on a steady downslide. On Tuesday, they stood more than 98 percent below their all-time high of $14. Meanwhile, the company's sock puppet icon, the center of a more than $20 million advertising campaign, has drawn a lot of attention. The nameless puppet, a creation of ad agency TBWA/Chiat/Day, first came on the scene in August 1999. It has since transformed from a company logo to something of an American pop culture icon. Although it has not appeared in any television advertisements since last January, according to a spokesman for Chiat/Day, the puppet has continued to make appearances in places such as ABC TV's "Good Morning America" and "Nightline" programs as well as the Macy's Thanksgiving Day Parade in New York City. The company also has launched a sock puppet merchandising campaign, including clothing and accessories, for pets and people, as well as a talking sock puppet toy programmed to recite five of its most famous lines. The Pets.com puppet also is at the center of an unusual defamation lawsuit. 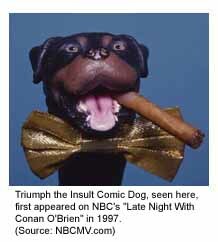 The company is suing writer-comedian Robert Smigel, whose "Triumph the Insult Comic Dog" made its debut more than three years ago and has been a regular character on NBC's "Late Night With Conan O'Brien" ever since. The lawsuit, filed last spring, seeks unspecified damages for trade libel and defamation stemming from comedy routines in which Triumph denounced the Pets.com puppet, calling him a "ripoff artist" who stole his identity. Pets.com spokesman John Cummings on Tuesday said he could not place a total value on the company's assets. However, he acknowledged that the sock puppet is one of Pets.com's main strengths. "I don't have any details on how we'll proceed with the disposition of assets, but the goal is to get the best value of our current assets," Cummings said. "The value is really what anybody would be willing to pay for it," Cummings added, referring to the sock puppet icon. "But right now, there are no specific plans. Its fate is unknown."